I learned a new language today! Unfortunately it was not French or Spanish because I want to learn those, but it was the language of crochet! Its a good language to know being that I really do enjoy crocheting, but when I go to read a pattern, I never know where to start. Today we were finally able to be in our studio working for a whole class period instead of critiquing or going on a fieldtrip. It was nice to do that. Pam taught some of us how to make a cute bag, and then she helped me read a pattern for a simple doily. I made two today, simple to make, but now I will be able to read patterns for more difficult things. I'm excited to keep crocheting! I also want to start making repeat patterns using photographs I have taken so far on my trip, and explore different areas of studio production. 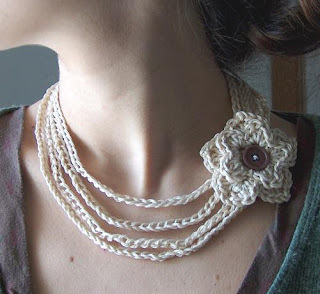 I found great images of neckpieces I want to try to recreate or use as inspiration like this one from a blogger CreativeYarn. So thats my excitement for the day! I spent the afternoon on the terrace as usual, emailing some wonderful friends, and attempting to watch Casablanca, although I didnt pay attention at all, but thats ok! Its the weekend here in Lacoste, with a fieldtrip tomorrow, and markets on Saturday and Sunday. All I know is that Lara had all of these chocolates on her bed, so its bound to be a good weekend! La vie est belle!